What should we name Trump: the Sequel? Well, President-elect Trump scored a sleeper hit with his stunning election-day performance at the ballot box. And what do studios do after scoring a hit? They greenlight a sequel! Let's get the obvious options out of the way: Trump 2: The Trumpening; 2 Trump 2 Furious; Trump 2: Nuclear Boogaloo; Trump 2: Judgment Day, etc. Leave your ideas in the comments. Oh, and be sure to check out Scott Marks' roundup of Trump cameos/performances prior to this, his dramatic triumph. So, there have been people around the internet wondering how to talk to their kids — and daughters in particular, given the Access Hollywood comments — about a Trump presidency. 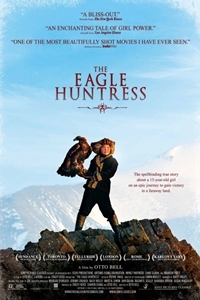 I'm not going to give any particular advice, but I will note that The Eagle Huntress is a sweet, uplifting, overtly political movie about a girl who sets out to do a thing normally reserved for men. And it's lovely to behold. You could do worse. 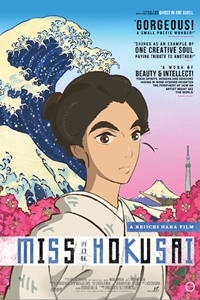 Speaking of daughters, Miss Hokusai is a story about a great artist ... told from his daughter's point of view. But it's about her, too. And it's good, in an enigmatic, open-ended sort of way. Speaking of enigmatic, perhaps the election has you feeling alienated, hardly able to recognize your formerly happy world, struggling to communicate with strange intelligences that don't even share your humanity. Well, then, you might sympathize with Amy Adams in Arrival. I didn't like it too much, but then, I'm an idiot. Most other folks thought it was just ducky. Stop the presses! (Kids, ask your parents what that used to mean.) I just got a call from Scott as he walked to the parking lot after taking in an early showing of the family holiday film Almost Christmas. Wonder of wonders: he gave it a three-star review. It's a new world, folks: Trump is President and Marks is guffawing at PG-13 Christmas comedies. 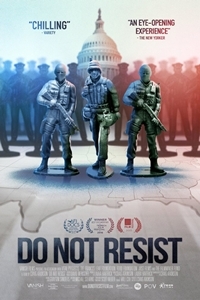 Anyway, you'll surely have more fun seeing that than Scott's other three-star offering this week, a documentary about the already-ongoing militarization of police called Do Not Resist. And alas, he didn't love Loving, for the same reason he didn't love Moonlight: "Directors make movies, not issues." And in hindsight, I shouldn't have sent him to the rockumentary We Are X. I just thought he might be in some kind of groove after Gimme Danger. Wrong again. Opening but not reviewed: Shut In and The Monster. Make your own Trump joke out of that. I'm gonna go watch Trumpbo.